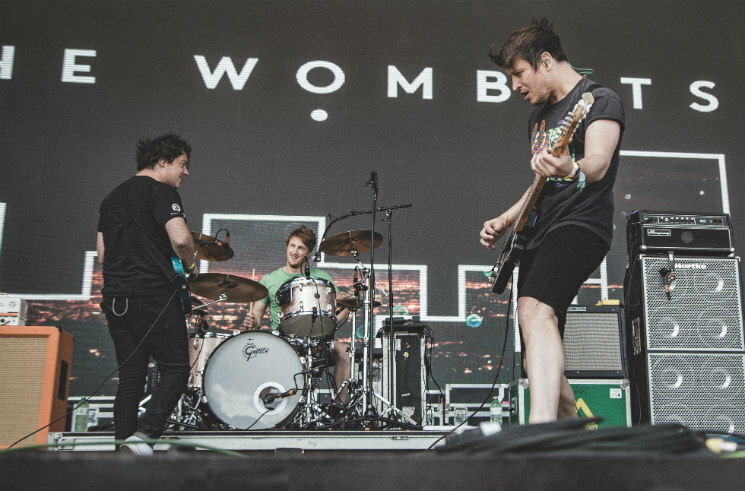 With thousands of fans back home in the UK, the Liverpool lads in the Wombats weren't used to playing such an early festival set, as they remarked during their 3 p.m. Sunday afternoon (June 12) time slot on more than one occasion. But a handful of Anglophiles came out in full force to support the pop-leaning indie rock trio at one of their smallest gigs (and their first for a Canadian festival). Playing songs primarily off of last year's Glitterbug, Dan Haggis' thunderous drumming, Matthew Murphy's trebly and tremolo-laden guitar playing and bassist Tord Øverland Knudsen's boundless energy were the perfect fit for the young Bestival crowd. Although few in the crowd knew all the words to their songs, the band delivered thoughtful renditions of "Give Me a Try," "Emoticons" and "Greek Tragedy," but seemed to get the most enjoyment after they'd realized their set ended a little early, and decided to take part in an impromptu jam filled with palm-muted riffs that seemed like they'd studied under Matt Bellamy and the boys. At a festival where clean, precise samplers were the norm, the band showed that sometimes it pays to play a little unpolished.